Periodically I get emails and comments asking me to post a recipe for one thing or another, usually something Japanese. I try to do so (eventually) with most things, though it may take a while between request and actual writeup since I try to make sure that if I do write it up, it will actually work. One of the things I've been asked about a lot is ramen, probably because it's so ubiquitous in Japan, and so tasty. 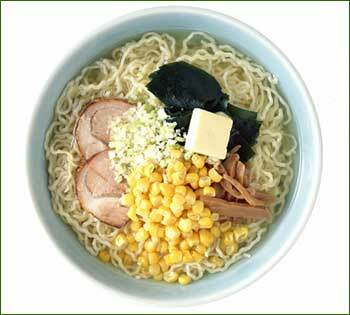 Since it's usually served as a sort of fast food, and because the instant and cup-noodle varieties are well, so instant, people may assume that it's not hard to make. When the weather gets warmer, we eat a lot of cold Japanese noodles: soba (buckwheat noodles), hiyamugi (thin wheat noodles), so-men (even thinner wheat noodles), Sanuki udon (thick wheat noodles- Sanuki is the name of a region famous for udon) and harusame (bean or 'glass' noodles). 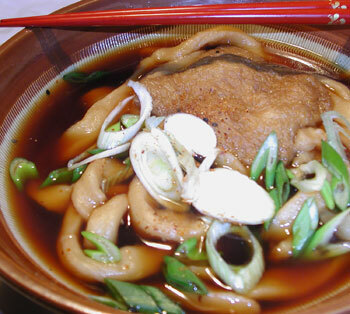 For most cold noodle dishes a salty sweet soy sauce based soup or dipping sauce called mentsuyu is used. You can buy pre-made mentsuyu concentrate, but to me most of them taste too sweet or are overwhelmed by a too-strong MSG or similar artificial tasting umami flavor. Making mentsuyu at home from scratch is not so difficult, and the difference in taste is quite worth the little extra effort. 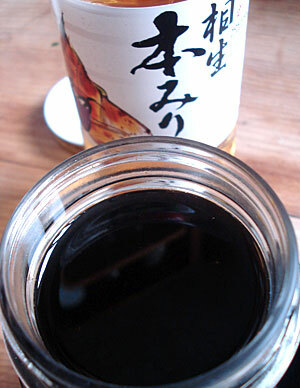 The base of mentsuyu is a mixture of soy sauce, sugar and mirin called kaeshi (or hon-gaeshi: hon means "real" or "authentic"). It can also be used as a flavoring base for many other things. You just need good quality dark soy sauce, white sugar, and good quality mirin. It keeps for months in the refrigerator, or even in the freezer (where it will stay liquid) so I like to make as big a batch as I can afford to price-wise and fridge-space-wise. 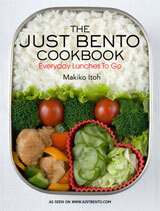 This is similar to the Japanese essence mix, but doesn't include the kombu seaweed or bonito. If you are a vegetarian you can use kaeshi safe in the knowledge that it's totally vegan, and combine it with a vegetarian stock. Kaeshi also lasts a lot longer since the basic ingredients are indefinite keepers. I'll be talking about cold noodles and such in upcoming posts, so if you'd like to follow along, you may want to make some kaeshi to be ready. This is a very traditional basic recipe. Summer in most parts of Japan is hot and very humid, so cold foods are very popular. 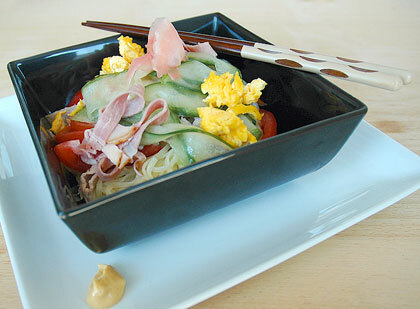 There are a lot of cold noodle dishes, such as chilled soba noodles and thin wheat noodes (hiyamugi or so-men). 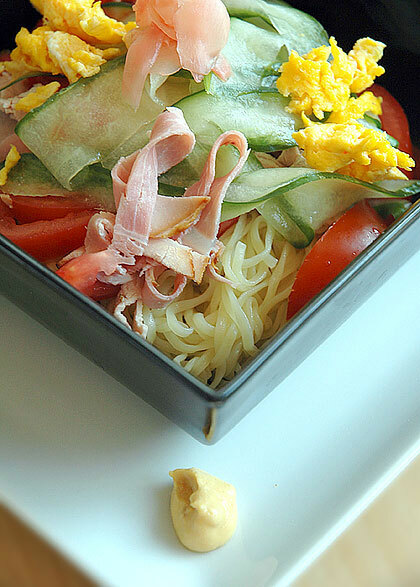 I love them all, but I think my favorite is hiyashi chuuka, which is Chinese-style cold noodles as interpreted by the Japanese. I haven't participated in Is My Blog Burning, the original food blogging event initiated by Alberto, for quite a while. However, I couldn't pass up on this month's theme, hosted by Cooking With Amy: noodles. I love noodles in all shapes and from all corners of the world. Two German guys are trying to eat their way through all sorts of "Asian style" noodles, and they are blogging their taste reviews (German site). I've tried some of the ones they've blogged so far though...and they are pretty bad.